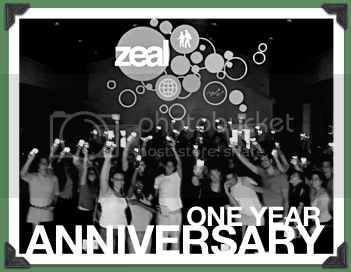 ZEAL is turning one year old in September. One year ago we set out to create an environment where young adults could feel at home in. We wanted to be relevant...but most importantly, we wanted God to be glorified. That has been our prayer from the start and it continues to be our prayer as we begin this new year of opportunities. Over the past year we have tried many different things at ZEAL. Some were a huge success...others, not so much. But we always left room to grow and we sure did learn a lot. We are always in the process of seeking what it is that the Lord is trying to achieve through us and I am honored to be a part of a ministry that seeks to honor Him and serve others. My hope and prayer is that you may find a "home" where you can fellowship with people who care about you and worship a God who loves you. Be it at ZEAL or some place else. 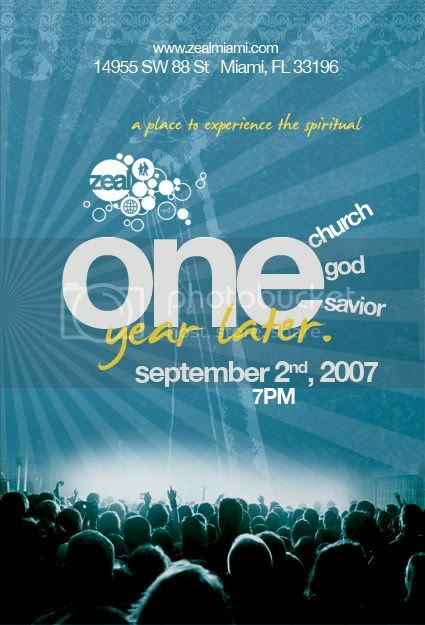 In any case, we will be celebrating ZEAL's very first birthday on Sunday, September 2nd at 7PM! So I REALLY hope that all of you can make it out and bring a friend...bring two friends...maybe even three! This is going to be a very special service and you don't want to miss one second of it. Trust me! So be on time and be ready to celebrate a very special birthday.